Metal building repairs and renovations contractor; Metal building builder, Metal Roof Replacement, Wall panel replacement, Roof coatings, metal roof leak repair, insulation retrofit, insulation repairs, painting, doors, metal roof skylights, steel structure, cutting and welding. Metal building repairs, since 1996. A metal roofer and metal building builder for over 20 years we have been providing quality industrial and commercial metal building repairs; metal roof replacement and repairs, wall panel repairs and replacement, waterproofing, and metal wall panel cut and paste to customers around Houston Texas. 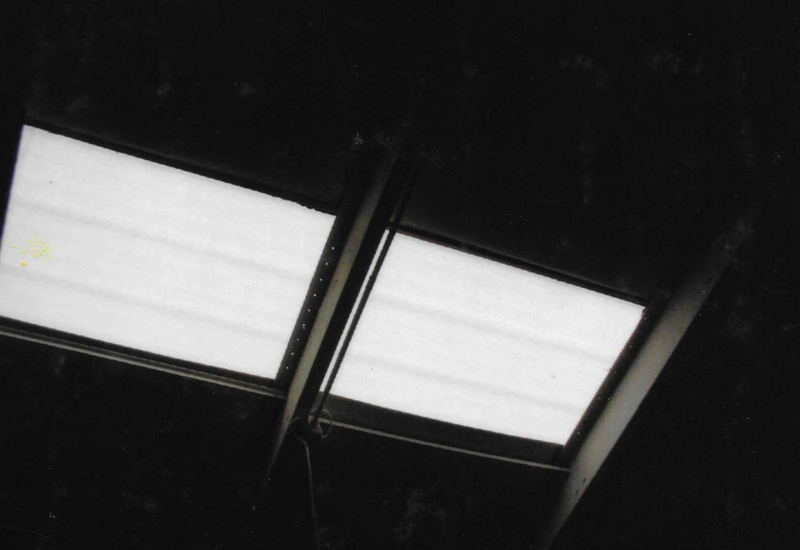 Whether its just a few translucient fiberglass skylight panels to replace or you are in need of complex renovations of large metal building facilities involving a change of use or a reconfiguration your facility, our experienced staff can get the job done. Our staff have a great deal of pride in their work. They are truly craftsmen, we will complete your project on time and within budget. For more information on metal roofing or any other steel building repairs, please call: 713-449-3430. We work at commercial sites, warehouses, and industrial plants. We are members of the Houston Area Safety Council, ISNetworld and Avetta. The photo above and below this section showcases one of our projects. The building was originally constructed in the 1940's. Our experienced staff installed new insulation, repaired and added steel structure, completed frame and footprint modification, new painting, new metal walls, new gutters and downspouts, and new galvalume plus roof panels. Metal building renovation contractor and builder, The above metal building repair is the after picture to the above building. Upon completion of this extensive commercial & industrial pre-engineered renovation, this industrial building looked just like a recently constructed pre-engineered metal building, as opposed to a steel and block building first built during the 1940's. New insulation, new metal wall and roof panels (25 year factory warranty), new block, repaired and added steel structure, frame/footprint/metal roof modification, new paint job, and new mechanicals and electric. For 1/4 the price of new in 1/3 the time to occupancy! For greater insight into the type of work our experts provide check out our service pages. We have worked on virtually every type of pre-engineered metal building including Butler, Varco Pruden (VP), American Steel Buildings, Nucor, Star, Arco, General Steel, Whirl Wind, Chief Buildings, Allied Steel Buildings, Federal Steel Buildings, Ceco Building Systems, to name just a few. After 20 years of providing metal roof repair services to pre-engineered metal buildings we have a lot of experience with many different type of buildings. In the end the construction has changed over the last 50 years but the basic structures are all very similar. Sometimes the use of a building changes, below a steel / metal building’s use was transferred from its previous use as a storage building to a process building. Project completed April 2017. Northwest Houston. Before, abandoned, ignored. Front view. Metal roofing contractor, metal building renovation project. Before metal building repairs , rear view of pre-engineered metal building. Damaged metal wall panel need repairs. Before - rear view of abandoned building, metal building insulation added. This abandoned building was very rusty. We installed 3 new overhead doors, removed three overhead doors, installed two new man/pass doors, removed and replaced 15 purlins, and cleaned, primed and painted all of the steel. We replace many of the roof purlins and wall girts that were rusted thru. We also repaired the base of rotted out columns by cutting out sections and welding in to place replacement steel. Because this building was not in use we were able to open it up to allow the work to be accomplished more efficiently. After purlins replaced, frame cleaned and painted. The metal building foot print was modified to meet the current production needs. This is the frame of a new awning. After a metal building wall and roof renovation - removed three overhead doors, re-located two overhead doors. Rear view. Small addition at front right. Front view with new eave addition and 110' awning added. Rear back- a repurposed building. This building was renovated in May of 2018, southwest of Houston TX. The roof, walls, and door were replaced. All insulation was also replaced. Some building really have some great potential, this one certainly did. What a great transformation. Before a metal building renovation. Metal wall panels and metal roof panels were old and replaced. Metal roof replacement, metal walls replacement..
Metalguard repairs all parts of a metal building, walls, roof, doors, and the structure Call 713-449-3430 for more information. When renovating a metal building contrasting colors at the rake and gutters do a nice job of highlighting the building. The front windows and doors still need to be finished. Metal building wall, roof and insulation replacement. Metal building restoration. We partner with other trades as needed to complete the entire project if that's what is required. Nice accent colors. Houston (Edna area) TX metal building restoration. The roof looked great also, we re-used the building owners ridge vents. The steel building below was a very nice metal building retro insulation transformation project. It included cut and paste on damaged sections of the roof followed by a sealing and coating. The electric system was upgraded and a new lighting system was installed, the interior was painted, and retro metal building white faced 8” insulation was installed. To finish it off, after these renovations were complete, the floor was coated. The building owner wanter to enhance the entrance of the “cookie cutter” look. Their building looked the same as all of the other metal buildings in the area. Above, during the project, an evening photo. Really a sharp look. At completion, we used a hidden fastener panel system on the new panels on the front wall. I gives an industrial metal building the finished look of a commercial building. We are a metal building repair contractor. Below (August 2016); before replacing metal wall panels, j-trim, and cutting out and replacing the damaged steel Cee channel frames supporting the overhead doors. Update, July 2017: Just finishing the metal roofing on the pre-engineered metal building below. We work with building owners and managers on building repairs, accomplishing goals as the budget allows. We are metal building contractors involved with repairing all components of metal building. METALGUARD has been renovating commercial and industrial, pre-engineered metal and steel buildings since 1996. With over 20 years of experience behind us, we focus on safety, quality and fair pricing. Our projects range from industrial roof repairs to complex renovations of large facilities involving a change of use or a reconfiguration of the facility. Our customers range from small businesses to Fortune 50 companies. In fact, we currently have a 3 year maintenance contract with one of the 5 largest companies in the world. Please give us a call, (800) 231-6971. We provide complimentary estimates, and are always ready to help establish a budget number for your steel roof or building. Providing metal roofing since 1996. Sometimes, people just go overboard with mastic when trying to repair a metal roof leak. Below you can see a before and after of a metal building roof that we repaired. The problem was not with the panels, but the transition trim. However, while trying to fix the leaking metal roof they damaged the panels. We replaced the original problem, the trim, and the problem that was created, the panels, and the now, the leaking roof problem is solved. Metal roof panel repair, transition trim and roof panels replaced. Metal roof sealing and coating in process. To the left a roof sealing in process. A metal roof does not require a coating application to be leak free. Professional metal roofer. During the sealing application process a fluid applied seamless membrane is installed at every potential water entry point. Fasteners, penetrations, transitions, ridge cap, and rake trim, are common roof areas requiring sealing. A roof coating is beneficial, however, if the budget isn't sufficient, a sealing application can be a very good option. We can economically stop a single persistent metal roof leak, or all of your steel roof leaks. Our 20 years of experience has taught us the methods that work. With our test studies, we know which urethane sealants and roof coatings that work best with steel roof panels. Replace the roof or waterproof and coat? Cut and Paste. When restoring a metal roof, some elements can be restored, and others require replacement. In the above, part of the metal roof was rotted out, and replaced with new R panels. The remainder waterproofed and coated. The skylights were also replaced. The metal roof coating process includes arresting any rust, protecting the sealing products, and extending the life of your metal roof. Professional metal roofer. Metal building renovations, repairs, and metal roofer waterproofing, Houston TX. We also repair built-up roofs, rubber roofs, TPO heat weld roofs, any commercial or industrial roof. Complete commercial & industrial metal building insulation renovation and repair services. Pre-engineered metal roofs, metal walls, and any other needs. to clean, bright, productive space! The above services include steel replacement, industrial metal building painting, and insulation replacement. Our metal building renovation projects range from simple inexpensive small projects to complete building renovations. Before we begin some renovations the question being considered is should I tear down the building and start over or should I renovate it. Also, we always put safety first. When replacement panels are necessary, we know who to call. We work with over 10 different metal building component manufacturers, if the profile of your metal wall or roof panel is still being produced, we know where to find it. We also know how to adjust if it is out of production. Sometimes it is desirable to alter the structure of your building. In the above, the end wall was aligned with the flow of the railroad track before we squared it off. It had been angled to accommodate an old train track. At completion, the renovated building looked like new, and at a fraction of the price of replacement! Also, it can be completed in a fraction of the time, without the hassle of all of permits required with new construction. Metal building repairs and renovations, Houston TX. and surrounding areas. Call about other areas. Below: Pre-engineered metal building before replacing old damaged white faced insulation. This insulation had seen better days. The old white insulation facing had shrunk and ripped. Below: View after removing the old insulation and replacing it with new insulation with reinforced white facing. This involved replacing it from the outside, all the insulation is re-installed as it was originally. Everyone was very happy with the results of this repair. The new white faced insulation installed is reinforced and stronger. Call for details. 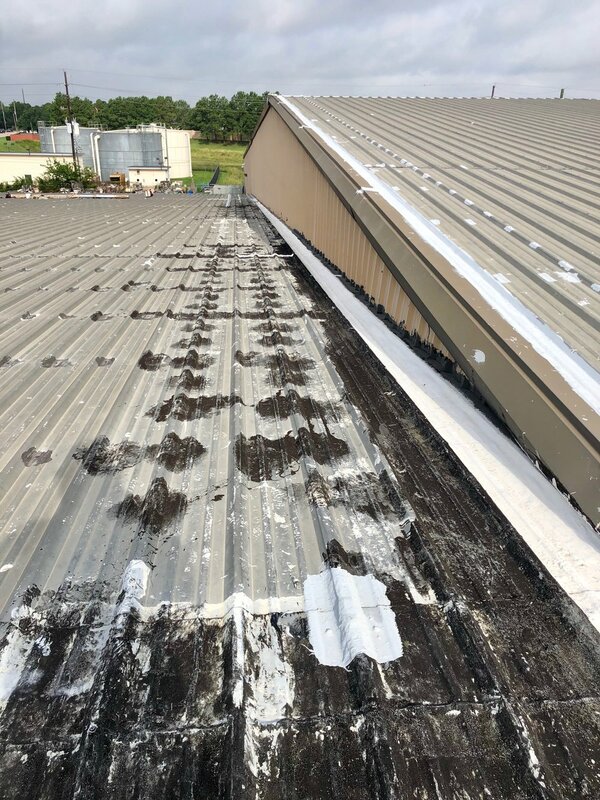 Metal building repair contractor-The above shows damaged, moldy, insulation before our industrial painting and retrofit insulation repair services began. It was very ugly and had no R-value. A new paint job with new skylight panels on the walls. Painting a steel column in process. Restored to the original red prime color. Metal building renovations performed in Houston TX. Metal building repair contractor-This old skylight in this metal roof leaked and was not allowing sunlight in. Installing a building addition to a pre-engineered metal building. New turbines and roof vents installed on this metal roof. The turbine and vents help exhaust the hot air. We are also very skilled at sealing leaking roof vents. This building was transformed from rusty and dull to bright, and clean at the completion of painting the metal building. This is before cleaning and painting the interior of the metal building roof and frame. With this replacement skylight, more light and no leaks! 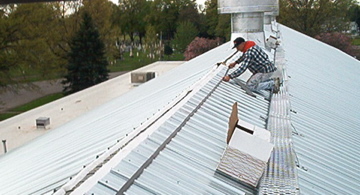 An internal gutter is sealed, then an industrial roof leaf guard is installed over the internal gutter. The industrial roof leaf screen prevents the gutter drains from clogging. Roof turbines and vents are an efficient way to exhaust hot air passively from a buildings. Thousands of cubic feet per minute can be exhausted. During the long stretch of 100 plus degree days in Houston, TX this is a nice feature to add to a building. Part of an interior renovation, a little cleaning and paint goes a long way.